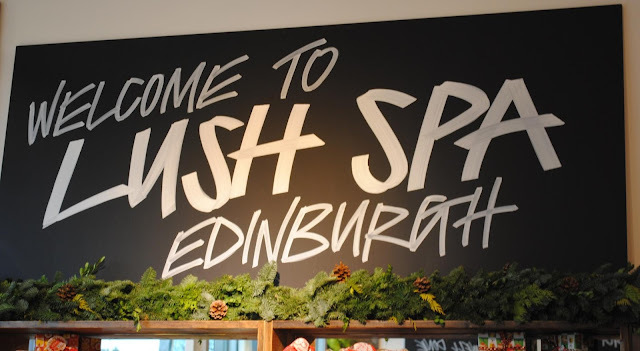 Last week the very first Scottish Lush spa opened up in Edinburgh - on Princes St just a little bit along from the old shop, sitting straight across from Edinburgh Castle. I'm a HUGE Lush fan, but who isn't? They are animal-friendly - using only vegetarian ingredients (and never, ever testing on animals), and people friendly - creating fresh products with little or no preservatives or packaging. So I was super excited when I was invited down to try out the signature spa treatment, Synaesthesia*. This is a ninety minute treatment where scent, sound, touch & sight all combine to create your chosen state of mind. It sounded a bit bonkers, but I was definitely keen to go with it, and see what actually happened. The spa is in the basement of the brand new Lush shop (which is much more spacious than their previous home). It feels nothing like what you'd expect from a spa - instead it's based on the founder's own kitchen, and is a cosy, homely space for you to relax and chat with your therapist before the treatment. 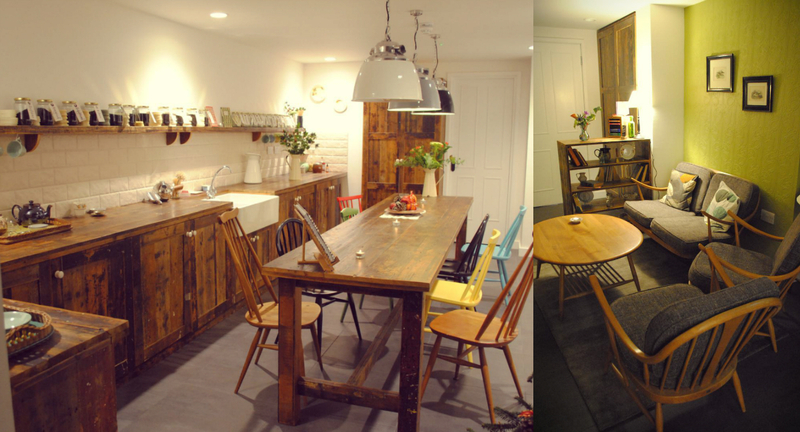 (I want those chairs!). There's a large blackboard in the kitchen and you are invited to pick the word that jumps out to you the most, which your treatment is then built around. I went for mind-cleanser (which sounded LOVELY) and was told I'd be getting a treatment of a head and face massage, hot and cold stones, leg massage, back massage & my choice of a stomach rub or chakra massage. Phew! Then I was asked to pick from one of a row of coloured bottles - scents that were going to be added to my treatment, but I wasn't allowed to chose by smell. Again, I had to just go for whatever appealed to me most. I picked a tiny bottle that said happy on it. You are then given the choice to shower/clean your make up off before the treatment (they have all sorts of nice lotions and potions in the bathroom for you to use). When you're ready the therapist gets you settled in the room and explains exactly what you should do (which is so helpful, especially if you're like me & get stupidly nervous you'll do something wrong!). I don't want to spoil the surprises of the treatment for you, but it was BRILLIANT! The treatment is choreographed to specially composed music which takes you across a day and night - I found myself drifting in and out, and every now and again would realise that birds were softly cheeping. Surreal but lovely! Afterwards you are given a cup of tea (brewed with some of the oils used in your treatment), a massage bar and bubble bar & a chat with your therapist who answers any questions you have. I was so chilled out that I couldn't think of any apart from asking who does the famous Lush handwriting (turns out it's one person called Jo!). I felt AMAZING afterwards - so ridiculously blissed out all day, and I ended up going to bed at 11pm and sleeping until 1pm the following day (and felt brilliant and chilled when I woke up too!). 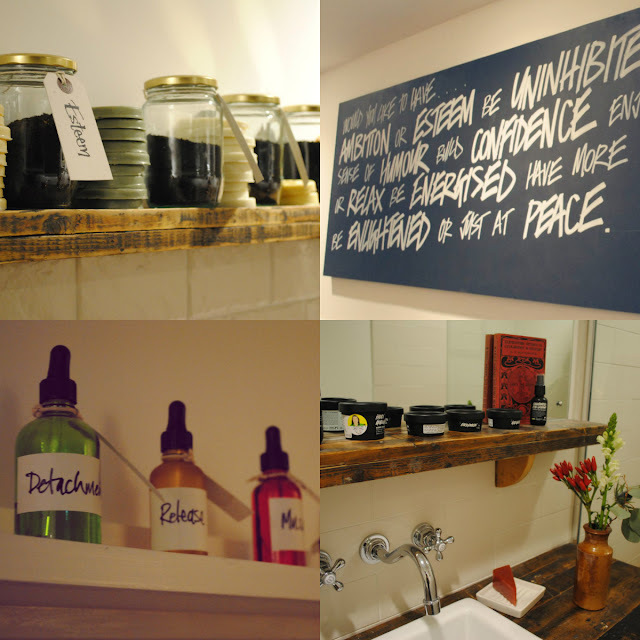 Treatments start at £40 and you can see what's on offer at lush.co.uk/spa. Thank you so much to Lush Edinburgh for having me along! Aaaaa! This looks and sounds unbelievably amazing! This sounds amazing! Too bad it doesn't seem like there are any in the US (though, even if there were, they would probably not be in my small town, haha). I love the idea of just picking the treatment based on a particular word or mindset. It looks so amazing, I went thru the website and I got surprised. There is a scrub treatment with a hot chocolate scrub. It is super cool, isn’t it nice? I should try once. I feel relaxed just reading this. I didn't know that lush did spa treatments. Sounds amazing.